For other uses, see Okie (disambiguation). In the mid-1930s, during the Dust Bowl era, large numbers of farmers fleeing ecological disaster and the Great Depression migrated from the Great Plains and Southwest regions to California mostly along historic U.S. Route 66. Californians began calling all migrants by that name, even though many newcomers were not actually Oklahomans. The migrants included people from Oklahoma, Arkansas, Missouri, Iowa, Nebraska, Kansas, Texas, Colorado and New Mexico, but were all referred to as "Okies" and "Arkies." More of the migrants were from Oklahoma than any other state, and a total of 15% of the Oklahoma population left for California. Ben Reddick, a free-lance journalist and later publisher of the Paso Robles Daily Press, is credited with first using the term Oakie, in the mid-1930s, to identify migrant farm workers. He noticed the "OK" abbreviation (for Oklahoma) on many of the migrants' license plates and referred to them in his article as "Oakies." The first known usage was an unpublished private postcard from 1907. Once the Okie families migrated from Oklahoma to California, they often were forced to work on large farms to support their families. Because of the minimal pay, these families were often forced to live on the outskirts of these farms in shanty houses they built themselves. These homes were normally set up in groups called Squatter Camps or Shanty Towns, which were often located near the irrigation ditches which ran along the outskirts of these farms. Indoor plumbing was inaccessible to these migrant workers, and so they were forced to resort to using outhouses. Unfortunately, because of the minimal space allotted to the migrant workers, their outhouses were normally located near the irrigation ditches, and some waste would inevitably runoff into the water. These irrigation ditches provided the Okie families with a water supply. Due to this lack of sanitation in these camps, disease ran rampant among the migrant workers and their families. Also contributing to disease was the fact that these Shanty Town homes that the Okie migrant workers lived in had no running water, and because of their minimal pay medical attention was out of the question. However, what native Californians failed to realize at the time was that these Okie migrant farm workers did not always live in the conditions that the Dust Bowl left them in. In fact, often these families had once owned their own farms and had been able to support themselves. This had often placed these migrant workers in a relatively comfortable middle-class situation for these families prior to the devastating drought (the Dust Bowl) in Oklahoma. Historian James Gregory has explored the long-term impact of the Okies on California society. He notes that in The Grapes of Wrath, novelist John Steinbeck saw the migrants becoming active union and New Deal agitators demanding higher wages and better housing conditions. Steinbeck did not foresee that most Okies would move into well-paid jobs in war industries in the 1940s. The children and grandchildren of Okies seldom returned to Oklahoma or farming, and are now concentrated in California's cities and suburbs. Long-term cultural impacts include a commitment to evangelical Protestantism, a love of country music, political conservatism, and strong support for traditional moral and cultural values. It has been said that some Oklahomans who stayed and lived through the Dust Bowl see the Okie migrants as quitters who fled Oklahoma. Most Oklahoma natives are as proud of their Okies who made good in California as are the Okies themselves – and of the Arkies, West Texans, and others who were cast in with them. In the later half of the 20th century, there became increasing evidence that any pejorative meaning of the term Okie was changing; former and present Okies began to apply the label as a badge of honor and symbol of the Okie survivor attitude. In one example, Republican Oklahoma Governor Dewey F. Bartlett launched a campaign in the 1960s to popularize Okie as a positive term for Oklahomans; however, the Democrats used the campaign, and the fact that Bartlett was born in Ohio, as a political tool against him, and further degraded the term for some time. In 1968, Governor Bartlett made Reddick, the originator of the California usage, an honorary Okie. And in the early 1970s, Merle Haggard's country song Okie from Muskogee was a hit on national airwaves. Also during the 1970s, the term Okie became familiar to most Californians as a prototype of a subcultural group, just like the resurgence of Southern American regionalism and renewal of ethnic American (Irish American, Italian American or Polish American) identities in the Northeast and Midwest states at the time. In the early 1990s the California Department of Transportation refused to allow the name of the "Okie Girl" restaurant to appear on a roadside sign on Interstate 5, arguing that the restaurant's name insulted Oklahomans; only after protracted controversy (and a letter from the Governor of Oklahoma) did the agency relent. Since the 1990s, the children and grandchildren of Okies in California changed the meaning of Okie to a self-title of pride in obtaining success, as well to challenge what they felt was snobbery or "the last group to make fun of" in the state's urban area cultures. While some Oklahomans refer to themselves as Okies without prejudice, and it is often used jocularly; in a manner similar to the use of Hoosier by Indianans, Yankee by Northeasterners, or "Cracker" by native Floridians, none of whom consider these terms particularly insulting when applied to themselves. Others still find the term highly offensive. Muskogee Mayor John Tyler Hammons used the phrase "I'm proud to be an Okie from Muskogee" as the successful theme of his 2008 mayoral campaign. He was 19 years old at the time. John Steinbeck's 1939 novel The Grapes of Wrath won the Pulitzer Prize for its controversial characterization of the Okie lifestyle and journey to California. In James Blish's Cities in Flight science fiction series, the term "Okie" was applied in a similar context to entire cities that, thanks to an anti-gravity device, take flight to the stars in order to escape an economic collapse on Earth. Working as a migrant labor force, these cities act as cultural pollinators, spreading technology and knowledge throughout the expanding human civilization. The later novels focus on the travels of New York City as one such Okie city, though there are many others. In On the Road, the road novel by Jack Kerouac – written between 1948 and 1949, although not published until 1957 – the term appears to refer to some of the people the main character, a New York author, meets in one of his trips around the United States. In the novel Paint it Black by Janet Fitch, the protagonist (an LA punk-rocker in the early 1980s) thinks of herself and her family as "Okies." Frank Bergon's 2011 novel, Jesse's Ghost, draws attention to today's sons and daughters of the California Okies portrayed in Steinbeck's The Grapes of Wrath. In Hunter S. Thompson's semi-autobiographical novel Fear and Loathing in Las Vegas, Thompson describes an incident in the beginning of the novel where he and Oscar Zeta Acosta (under the pseudonyms of Raoul Duke and Dr. Gonzo respectively) pick up a hitchhiker on the way to Las Vegas, whom Thompson describes as a "poor Okie kid". California Okie – Buck Owens (1976). Dear Okie – Doye O’Dell/Rudy Sooter (1948) – "Dear Okie, if you see Arkie, tell ’im Tex’s got a job for him out in Californy." Lonesome Okie Goin’ Home – Merl Lindsay and the Oklahoma Night Riders (1947). Oakie Boogie – Jack Guthrie and His Oklahomans (1947) – considered by many to be the first Rock & Roll song. Okie – J. J. Cale (1974). Okie Skies – The Bays Brothers (2004). Okies in California – Doye O'Odell (1949). Ramblin' Okie – Terry Fell. She's An Okie – Al Vaughn. April The 14th Part I & Ruination day Part II "And the Okies fled. And the great emancipater" (Time-The Revelator – Gillian Welch. Welch/Rawlings (2001). "Israelites & Okies" a song from The Lost Dogs (Album Old Angel – Terry Taylor  (2010 Fools of the World). McDaniel, Wilma Elizabeth. California Okie Poet Laureate. All works. Charles, Henry P. That dumbest Okie, and other short stories: Oklahoma! "The land of honest men and slender women." Wetzel, c1952. Call OKIE is a non-profit organization created to oversee underground utilities and excavations in the state of Oklahoma. It was created in response to the Oklahoma Underground Facilities Damage Prevention Act enacted in 1981. Okie was the name of two P-47 fighter/bombers piloted by Maj. Quince L. Brown of the 84th Fighter Squadron, 78th Fighter Group, during World War II. Brown was one of the 8th Army Air Forces' first aces and credited with 14.333 victories. His first P-47D was noted for its distinctive artwork. He was killed during his second combat tour. Brown's hometown was Bristow, Oklahoma, and he was inducted into the Oklahoma Aviation and Space Hall of Fame in 1994. OKIE (Oklahoma Israel Exchange) is an independent non-profit organization established to coordinate economic and cultural activities between the state of Oklahoma and the state of Israel. It was created 1992 by Oklahoma Governor David Walters. The Okie Derby is the world's largest proficiency air rally. It is sponsored annually by the Oklahoma Chapter of the Ninety-Nines (International Organization of Women Pilots). An OKIE pin, a promotional souvenir developed by Governor Dewey Bartlett, (and an Oklahoma flag), was placed in the Apollo 10 lunar module Snoopy by Commander Thomas P. Stafford before it was sent into orbit around the sun. The battleship USS Oklahoma was affectionately called "Okie" (or "Okey") by her crew until her loss in 1941, after being sunk at Pearl Harbor and salvaged. ^ Pryor, Alton (October 27, 2012). Little Known Tales in Oklahoma History. Stagecoach Publishing. p. 55. The migrants included people from Oklahoma, Arkansas, Missouri, Iowa, Nebraska, Kansas, Texas, Colorado and New Mexico, but were all referred to as "Okies" and "Arkies." ^ Stewart, Roy P. "Postal Card Proves Sooners Were 'Okies' Way Back In 1907," Thomes Mrs. Agnes Hooks of Thomas with a postal card mailed at Newcastle, Ind. in 1907, address to a Miss Agness Kirkbridge, with the salutation: "Hello Okie – Will see you next Monday night." Signed: Myrtle M. Pence. Mrs. Hooks says Agness Kirkbridge was an aunt of hers. The Kirkbridge family came to Oklahoma Territory in 1904 and settled south of Custer City. ^ DeAngelis, Gina (2003). "Baked Out and Broke: The Okie Migration". Cobblestone. 24 (4). ^ Curtis, James (1986). 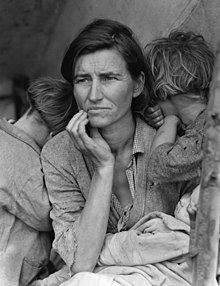 "Dorothea Lange, Migrant Mother, and the Culture of the Great Depression". Winterthur Portfolio. 1 (21): 1–20. ^ Haslam, The Other California, p. 107: "Says Jim Young, chancellor of Bakersfield College, 'I'm proud of my folks and everyone else who came out here and were called Okies, and who made new lives for themselves.' Young, of course, symbolizes well why others in the Central Valley are so proud to claim that term Okie. ^ "State to Print 'Okie Dough'," The Daily Oklahoman, Thursday, 27 October 1955, p. 20, col. 3: "A new type of money, designed to boost Oklahomans' pride in the Sooner state, soon will be off the press as part of the Greater Oklahoma City Forward committee's program. Known as "Okie Dough," the script will also be useful in braging [sic] in the other 47 states." ^ Editorial, "Speaking of Okies," The Daily Oklahoman, June 6, 1970, p. 8, col. 1: "Bartlett did not invent the term. He simple recognized its existence in the vocabulary – and gambled that nothing was more likely to erase its stigma than letting outsiders know Sooners themselves rather liked being called Okies." ^ "Democrat Gets In Plug for Donkey," The Daily Oklahoman, Friday, June 2, 1970, p. 3. col. 1: "In a release last week, Kennedy [State Democratic Chairman J.C. Kennedy] charged, the pins were campaign buttons for Gov. Bartlett. He demanded Monday that state employees be instructed to view all Okie type paraphernalia as political material and that it be treated in accordance with state rules and regulations governing such matters." ^ David Colker, "Los Angeles County News in Brief: Quake Delivers Knockout Punch to Okie Girl Eatery," Los Angeles Times, February 2, 1994, Part B, p. 2. ^ Windschuttle, "Steinbeck's Myth of the Okies": "Unfortunately for the reputation of the author John Steinbeck, however, there is now an accumulation of sufficient historical, demographic, and climatic data about the 1930s to show that almost everything about the elaborate picture created in the novel The Grapes of Wrath is either outright false or exaggerated beyond belief." ^ Igler, The Human Tradition in California, p. 144: "Charles Schindo, in Dust Bowl Migrants in the American Imagination (1997), contended that Steinbeck and his fellow 1930s liberals were elitists who misinterpreted the Okie experience and then imposed that leftist misinterpretation on the American consciousness." ^ Oklahoma One-Call System, Inc.
^ Young, Jim, "Apollo Carries Sooner Cargo", The Daily Oklahoman, Monday May 19, 1969, p. 1 col. 1: "Plans call for one flag and one Okie pin to be placed in orbit around the sun when astonauts abandon their lunar module prior to their return to earth." Lange, Dorothea; Paul S. Taylor. An American Exodus: A Record of Human Erosion. 1939.